-Not being able to generate positive reviews? -Negative reviews hurting your business ? -Acquire more customers and increase your revenue? -Maximize your brand visibility and exposure? IF SO - PureORM IS WHAT YOU ARE LOOKING FOR! PureORM is an affordable all-inclusive easy to use online review generating and management software designed to drive new customers to your business, maximize your online visibility, credibility & findability, and generate higher revenues effortlessly and organically! Thank you for your interest in PureORM! Increase your organization’s average star ratings across sites like Google, Facebook, BBB! and everywhere else clients & customers are finding you. Your customers receive a simple survey question. They respond about their experience with your product/service and if it’s positive they’re asked to post a review online! Simply add your customers. All you need is their email address to get started. Input your recent customers name and email address into the form and sit back while our proprietary review funnel does the rest. Zero technical skills required, and it takes virtually no time. Customers receive a simple single-question survey via email to their inbox. Your recent customer responds sharing their experience about your product/service and based on their response, are routed to post a review online or a company branded page matching the sentiment of their feedback! 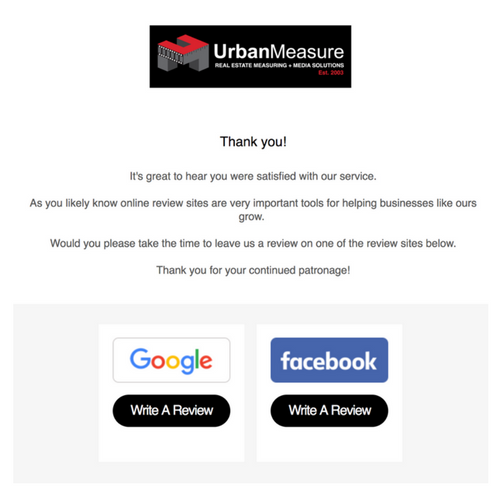 Positive responders are immediately asked to leave a review on top sites like Google, Facebook or other sites, where negative responders are directed to a feedback form and asked how your business can improve based on their experience. "PureORM has significantly improved our overall online reputation. I can finally rest happy!" "PureORM has allowed my small independent body shop to compete with the large national chains." "PureORM has been by far the single most valuable tool we use in our business." WHY WORK WITH PURE DIGITAL MEDIA SYSTEMS? Pure Digital is a proud Affiliate Partner of the BBB of Southern Alberta and East Kootenay, servicing clients across North America Coast-to-Coast with offices in Canada and the United States.